I was asked recently when I would play a regular tournament again. I don’t really know – I’m sure that I will play a tournament at some point, but I just don’t know when. At this point, it’s been 19 months (and counting) since my last tournament. I try to take the USCL seriously, but for these purposes, I’ll discount it because it’s not FIDE (or even USCF) rated. I haven’t really been playing on ICC either. I wasn’t an ICC addict beforehand, and I regularly go months without ever playing a game on there. However, in the past month, I’ve played more blitz games on ICC than in those previous 18 months combined! (As a side note, this isn’t even my longest break from tournament play. During my senior year of high school, I didn’t play a FIDE rated event for 8 months after the World Youth U-18 Championship. Then after a brief flurry of 3 events packed into 1 month, I didn’t play a FIDE rated event during my first two years at UC Berkeley. Anyways, I thought I’d share some recent blitz games that I found interesting. 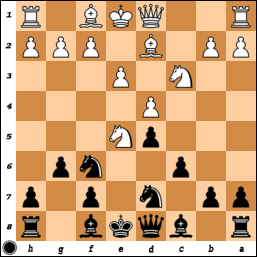 This is from a game (I have the black pieces) against an FM in the 5-minute pool. 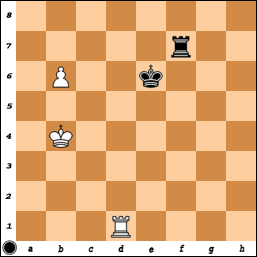 White’s last two moves, 7.cxd5 and 8.Ne5, really surprised me. It took a little while for the old grey cells to start working, but I managed to come up with 8…Nxe5 9.dxe5 Ng4 10.f4 d4 11.exd4 Qxd4 12.Qf3. Over at the Chess Mind blog (http://www.thechessmind.net/), there was an entry from March 9th about an interview with Judit Polgar (the interview is here). One of the two noteworthy items (according to Monokroussos) was her disgust over IM Maria Muzychuk playing “too long”, especially with regards to the “last two moves.” That seemed somewhat interesting so I took a look at the game. A few chess sites have linked to this, but in case you haven’t seen it, there’s an interesting old interview with Capablanca that has now been translated into English. It can be read here. There are all sorts of major gaps in my “chess culture,” as I never studied the games of most world champions and so on. For example, I still haven’t played through most games from the Kasparov-Karpov matches or the 1972 Fischer-Spassky match, let alone less famous battles. However, thanks to the study plan of Richard Shorman, after a bunch of Morphy and Anderssen games, the Blue Knights group (our team name) moved on to Capablanca. After studying those games, I continued to make my way through most of the rest of his games. All told, I think I have 10 books about or by him, and besides some tactics books, they generally make up a rather short list of chess books that I’ve read front-to-back.